Good morning! Happy Monday! How was your weekend? Spend time sewing? Seems like it based on all the pictures I saw! I did some time sewing, but we also had plenty to do around the house. Bit by bit we're going through our boxes and deciding what is 'kitchen worthy'. Honestly, can't I set up a kitchen in the garage and then just use my real kitchen to look at? Because that's all I want to do. And also, take a thousand pictures of my coffee at the kitchen window, and my $3.99 cake stand from the Target Dollar Spot or whatever it's called now. I went to the garden center and picked up a couple of pretties, first this pretty campanula in faux berry basket and a daisy of some sort for outside the window on the ledge. 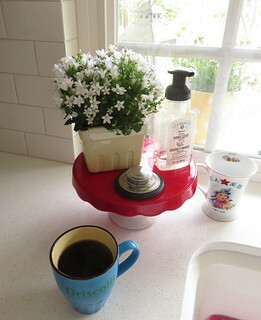 I have a cute polka dot pot courtesy of one of my many trips to Home Goods in the past and the daisy looks so cheerful. And just so I can stare at this little wedge of kitchen day and night, I put a battery operated candle with a timer in a little galvanized lantern type thing outside the window.. OMG I need to move away from the window. But for right now I can't. And no one can make me. I can stay there at the counter looking out at the birds and read all my new appliance manuals. I hope I don't have to go though some kind of certification to use my microwave. Holy cow, everything is so complicated. Spring is here and it is great to hear the birds in the morning. I have lots of sewing to do this week. Farm Girl Vintage and Slendid Sampler blocks, bind a quilt and make pillows. Happy sewing! I love spring. As I type this I can hear them singing to me this morning. Your kitchen looks so clean and fresh...feel free to show more pictures! If your micro has a reheat function you're in the money! It's the difference between incinerated leftovers and gently reheated seconds. 😂😂😂😂 And this is such a pretty vignette I would stand and stare too...at least til I needed to refill the coffee cup. 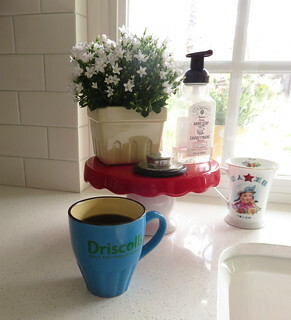 I'm so glad you are enjoying your new kitchen and the kitchen window with flowers inside and out. I was ready to hang my spring wreath on the front door and buy some pansies - but winter had to chuckle its way through the air last night. Oh well, glad the winter tires were still on :)! OhMyGosh -- you're hysterical PKM!!! STEP AWAAAAAAAY FROM THE WINDOW!!! I have that same feeling about sitting on the patio just staring off at the fountain in the lake. I don't want to move. You stare at the coffee and window setting as long as you like. LOL. But your coffee may get cold.